Thursday the 26th of May 2016 was a sad day indeed for pot advocating Canadian citizens everywhere, but it was even sadder still for those living in Toronto. 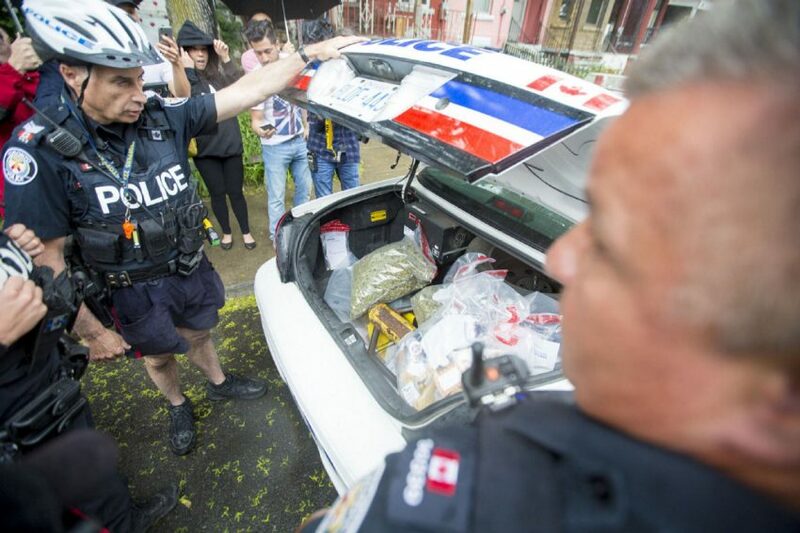 Police carried out a series raids nicknamed ‘Project Claudia’ on 43 out of 83 different dispensaries in the Toronto area. City officials alerted all of the property owners of said raided dispensaries that they were infringing on zoning bylaws by leasing to dispensaries that are accused of selling cannabis to non-patients earlier this month. Toronto police chief Mark Saunders released details about the previous day’s raids this morning. To see the complete half hour press conference that was live streamed at 10:30AM, click here. Police seized over 250 kilograms of dried bud, over 100 kilograms of cannabis-infused edibles and over $150,000 cash. 90 People were arrested and law enforcement proceeded to file over 180 charges stemming from the raids. Individual property owners are also potentially facing $50,000 fines due to zoning infractions. A protest was planned for the same time and location as the press conference this morning. Protestors repeatedly interjected him, asking various questions often too fast to answer. One such line of questions came from multiple people “where is the harm in taking too much THC?” “Who are the victims?” “Show me a victim”. Others went on to say “show us the hospital records” “has anyone died ever died from a cannabis overdose ever?”. Saunders stated as protesters continued asking where the potential harm from medical marijuana comes from “If I were to ask how much THC is in each product, no one here would be able to define that and that there lies the problem,”. Although the entire country of Canada has had legal medical marijuana since 2001, technically there are no licensed dispensaries. According to Canadas medical marijuana law, the only licensed sellers of medical cannabis are registered by Health Canada. To make matters worse, said medical cannabis sellers only distribute their products through the mail. “Knowingly selling without a license issued by Health Canada is unlawful, you can’t be doing it,” said Mr. Saunders. Saunders went on to add that some dispensaries are still currently active in Toronto. But that was due to the fact that the police department had not received complaints about those specific facilities. The investigation is ‘ongoing’. These raids come after the Canadian government has already stated that they are planning on legalizing recreational marijuana by spring 2017. This idea is one of the main principles Justin Trudeau (Canadians current prime minister) ran on in 2015.